To celebrate the Summer holidays we decided to host a free prize draw with entrants submitting an easy online form to give them the chance to win an amazing Kindle Fire just for the Summer holidays. We had a great number of entries and on Monday 29th of July one of our admin team Steph pulled the winners name out of the hat. 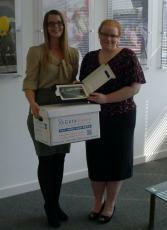 Our lucky winner was Sarah Porter of Profile Communications in Winsford. ‘Wow! I am totally shocked, Thanks. I can’t believe I have won the Kindle Fire to be honest, I am not a very lucky person! I entered the competition as I use twitter regularly each day and saw the tweet from DataSpace a couple of times on my twitter feed. I thought it was worth entering the competition as it was a straight forward process with the possibility of winning a great prize. Why not follow our social media accounts today? Sarah did and now she is the proud owner of a brand new Kindle Fire! 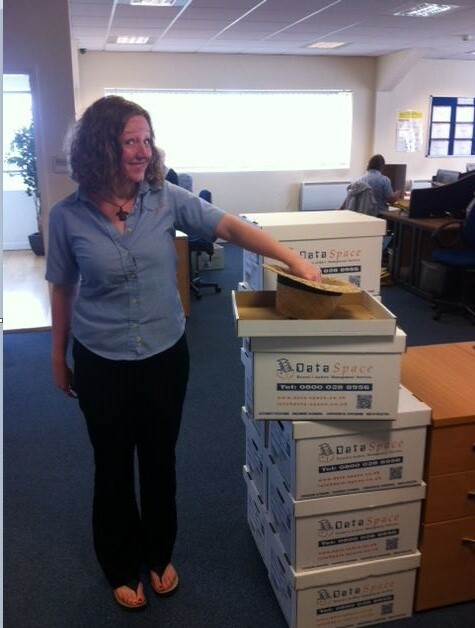 Follow @DataSpaceUK on Twitter or ‘Like’ DataSpace UK on Facebook and keep up to date with important Document Management and Data Protection news and Great Offers. I delivered Sarah her prize in person and she could not have been more pleased with her new E-Reader. It was lovely to meet you Sarah, everyone here at DataSpace hope you enjoy your prize and I am sure it will come in handy with your luggage allowance for your Summer hols. DataSpace are the Document Management Specialists located in the North West, providing secure storage facilities, shredding and scanning solutions of a variety of items to clients in all sectors. For more information about our services or a FREE no obligation quotation please do not hesitate to call us on 01606 331115.